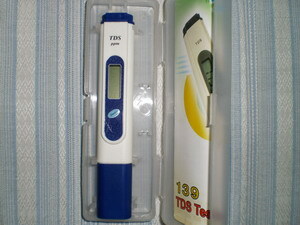 TDS-139 is a pocket sized TDS meter which can be used in a large number of applications including Production and drinking of pure water, Cleanliness of swimming pool water, Food processing, Hospitals and Medical products, Aquatic cultivation, Boiler water, Households and offices, Aquarium water, Teaching of physics and chemistry, Electroplating water, Cooling towers, Laboratories, Ionized water and water quality testing etc. Total Dissolved Solids (TDS) are the total weight of all solids (minerals, salts or metals) that are dissolved in a given volume of water, expressed in milligrams per liter (mg/L), or in parts per million (ppm). If the TDS levels are not correct, your fish may not be able to properly cycle it's "drinking" and may experience dehydration or fluid loss via gills. Get t he tester that measures water purity, conductivity and determines the quality of the water used.